The Norwich Terrier is an assertive, happy, affectionate, spunky and loyal dog who loves your attention and will do just about anything to get it! He is sweet and devoted, and likes to cuddle and be close to you--but he is not a lapdog. He is energetic and active and needs a great deal of exercise and mental stimulation. He is not the kind of dog who can be left alone in a yard or in a kennel. If ignored, he becomes restless, upset and unhappy, and can bark or begin to dig. He can dig under a fence and escape. He craves human companionship and wants to be involved in his family's life and activities. He needs a variety of fun things to do, since he dislikes routine and repetition. He is very playful, and loves balls and toys and brisk walks or jogs with you through the neighborhood. When out walking he should always be leashed, since he will chase after small animals. He is easy to train, as long as you use consistent commands and a positive, fun approach. He is sensitive to corrections and to scolding. He wants to please you, but can also be stubborn and a bit of a smart aleck, though he will generally respond to the command, Enough! He can be difficult to housebreak. He is fearless and a good watchdog, quick to bark when he hears a stranger but not prone to barking unnecessarily. He is not a yappy dog. He loves people, although he can be cautious with strangers if he isn't given a chance to meet new people while still a puppy. He loves to be with children. He is very good and playful with them, as long as they are well-behaved, and as long as very young children are supervised and taught not to be rough with him. He does well with other dogs and pets, although less well with rodent pets, and he must be taught to appreciate cats. He virtually doesn't shed, and so would be a good pet if you like a neat and tidy, hair-free home. The Norwich Terrier is 9 to 10 inches tall (to shoulders) and weighs 10 to 12 pounds. He has a double coat consisting of a medium-length, straight, wiry outer coat and a thick, soft undercoat. His coat color can be red, wheat, black and tan, or gray. The Norwich Terrier began as a breed in Eastern England, an important farming and sporting district where small terriers were used to hunt vermin and keep stables free of rats. There was no real planning to the development of the breed, but by the 1880's the Norwich, then sometimes known as the Cantab Terrier or Jones Terrier, was very popular with students at Cambridge University, and was well established near the city of Norwich. A breeder named Frank Jones had begun to develop the breed, and a well-known fox-hunter named "Rags" became the foundation for the Norwich Terriers that followed. The Norwich shares his ancestry with the Norfolk Terrier; both were probably bred from Border, Cairn and Irish Terriers. Both dogs were simply referred to as the Norwich Terrier when recognized by the English Kennel Club in 1923. There was very little interbreeding between the two types after World War II, however, and by 1964 the English Kennel Club had designated the drop-eared variety as the Norfolk Terrier, and the prick-eared as the Norwich. The first Norwich terrier was registered in America in 1936. The two breeds were not separated by the AKC until 1979. 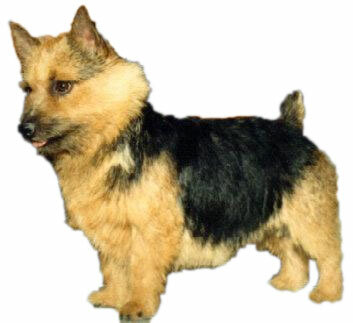 The Norwich Terrier's AKC popularity was 95th out of 157 breeds in 2007.